The course of B. Tech. study shall be of four years (eight semesters) duration. Each year consists of two semesters, namely odd and even semester. The academic year shall commence with the start of odd semester. Each semester shall ordinarily be of 100 working days including examinations. All eligible students must register within specified duration in each semester. Admission in B.Tech. First year (I Semester) will be made on the basis of JEE-MAIN ranking through the counseling conducted by the Uttarakhand Technical University, Dehradun. Whereas, admission in B.Tech. Second year (III Semester, for Lateral Entry students only) will be made through the entrance examination conducted by Uttarakhand Technical University, Dehradun. Apart from the above any Government/University order regarding the admission policy will be implemented accordingly. Admission on migration of a student from any other University/College to this College is not permitted. In general, each and every student is required to attend all the lectures, tutorials, practicals and other prescribed curricular and co-curricular activities. In case a student fails to attain a minimum of 80% attendance in any subject(s), he/she will not be allowed to appear in the end semester examination in the concerned subject(s). However, a further 15% shortage of attendance can be condoned on medical grounds or any other genuine reasons, by the Principal on the recommendation of the Course Counselor forwarded by the concerned Head of Department. No student will be allowed to appear in the end semester examinations if he/she does not fulfill the attendance requirements (minimum 65%) as listed in clauses 2 & 3 above and such student(s) shall be treated as having failed in the subject(s) and will be further governed by clause no. 8 & 9. Sessional marks to the detained students shall be awarded only after he/she satisfies the conditions under clause 8(4). The attendance shall be counted from the date of commencement of the classes up to the last teaching day including extra classes. The maximum time allowed for a student to complete his/her B.Tech. Course shall be 7 years. If a student at any stage of his/her course is found unable to complete it within the said time, he/she shall not be allowed to continue the studies further. The 4 years curriculum will be divided into 8 semesters and shall include lectures, tutorials, practicals, seminars and project in addition to practical training and educational tours as defined in the scheme of examinations. It will also include co-curricular and extra-curricular activities as framed from time to time by the College. 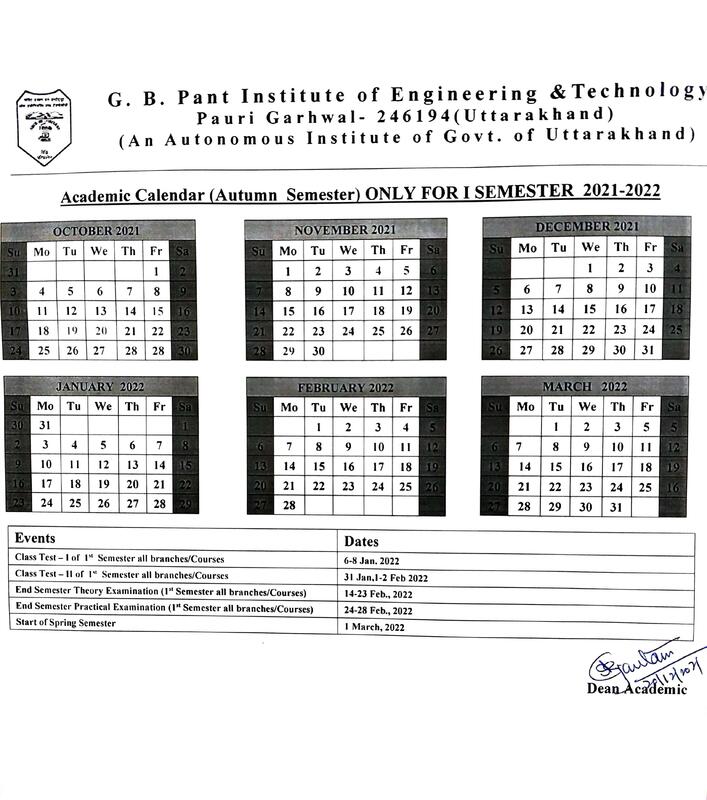 If at the beginning of 3rd semester any seat(s) falls vacant in any branch due to any reason, the students of that Year will be eligible for change of branch against these vacant seats as per their merit of First Year. The vacant seat of a reserved category will be available to the student of that respective category only. However, if for any horizontal reserved category seat any student of that subcategory is not available, then that seat may be offered to the student of the same main category. The change of branch from a particular discipline will be allowed till the total strength of students in that discipline remain to a minimum 50% level of the sanctioned strength. Any student who has any back paper or has obtained grace marks shall not be allowed for any change of branch. The change of branch, if allowed, will become effective from B.Tech. 3rd Semester. Further change of branch shall not be permitted. The Student's performance will be evaluated as per the evaluation scheme prescribed for every semester. The minimum pass marks in a subject (including Sessional marks) shall be 50%, however in the end semester examination he/she has to attain minimum 40% marks. A student clearing all subjects with more than 50% aggregate marks in an end semester examination shall be promoted to the next semester. A student failing in not more than two subjects (Theory and/or practical) of an end semester examination shall be governed by clause 9. All other students will be required to repeat the semester either as regular students, after reregistration or opting for ex-studentship. This facility is however subjected to the time limits stipulated in ordinance. A student detained in any subject(s) due to shortage of attendance will be treated as failed in that subject(s). This is included in the maximum limit of failed subjects as given in clause 8(2). The detained students will have to re-register in these subject(s) in the next academic session in the corresponding semester and will have to attend the classes to fulfill the minimum attendance required as per clause 3 and shall appear in the end semester examination. The students having carryover(s) will have to appear in the regular end semester examinations as and when scheduled. However, those students who are at the verge of completing their degree program, special carry-over examinations will be held after the 8th semester examination. Marks obtained in the carry-over examination shall replace the original marks but the sessional marks will remain unaltered. However, for detained students the sessional marks obtained by him/her by re-registering in the course shall be considered. Those students who have failed to gain promotion to the next semester and have to only clear certain examination(s) can opt for Ex-studentship i.e. they can prepare for examinations at home and can appear for the examination(s) after filling the examination form and submission of requisite examination fees. The student scoring highest marks in a particular branch without any back papers in the entire degree program will be awarded Gold Medal. The student scoring second highest marks in a particular branch without any back papers in the entire degree program will be awarded Silver Medal. The student scoring third highest marks in a particular branch without any back papers in the entire degree program will be awarded Bronze Medal. If a student secures 75% or more marks in aggregate in the entire degree program, he/she will be placed in First Division (with honours). If a student secures 60% or more marks in aggregate in the entire degree program, he/she will be placed in First Division. If a student secures 50% or more marks in aggregate in the entire degree program, he/she will be placed in Second Division. If a student secures less than 50% marks in aggregate in the entire degree program, he/she will be placed in shall be declared FAIL. A maximum of total 5 marks may be awarded as grace marks in one subject only in every end semester examination provided that the student after award of these grace marks becomes qualified for promotion to next semester. If a student is not satisfied with the marks awarded to him in the end semester examination of a theory paper, he/she can apply for scrutiny in that subject with deposition of requisite fee. If after scrutiny still he/she is not satisfied, he/she can apply for reevaluation in that subject with deposition of requisite fee. To replace the original marks with the marks obtained in the reevaluation, the difference in the two marks should be minimum 10% of the maximum marks of the paper. The marks of General Proficiency will be compiled by the course counselor. He/She is not found qualified as per AICTE / State Government norms and guidelines or the eligibility criteria prescribed by the University. He/She is found unable to complete the course within the stipulated time as prescribed in clause 4. Once a student is given admission to the college he/she has to register for first/third (for lateral entry students) semester in the same academic session failing which his/her admission shall be considered cancelled. He/she is found involved in creating indiscipline in the College.